This epic film takes a riff on actual historical events — the tense period of the 16th century, before the invasion of the Spanish Armada, when English ships were harassing Spanish ships without much disapproval from Queen Elizabeth I. 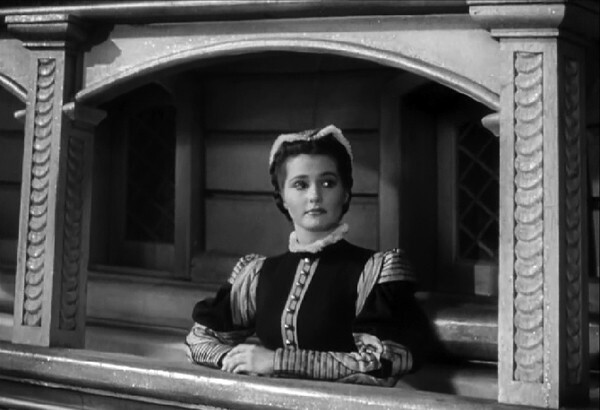 The Sea Hawk (1940) invents a privateer by the name of Geoffrey Thorpe (played by Errol Flynn) as the chief fellow who’s going to get under Spain’s skin. 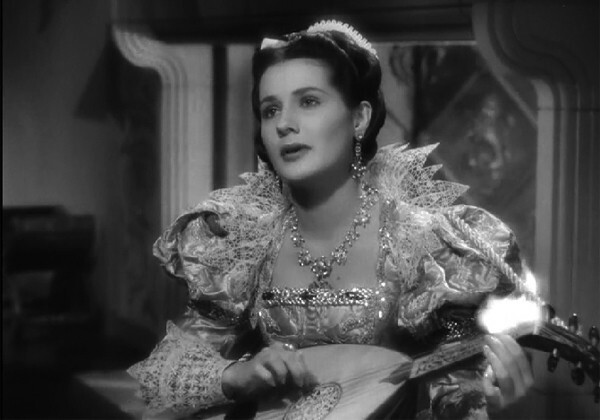 And to complicate matters, the Spanish ambassador has a pretty niece, aka love interest, Doña María (played by Brenda Marshall). There’s an adventure with Thorpe pirating it off in Panama, while María improbably becomes QEI’s maid of honor. Derring is do’ed, swash is buckled, and England triumphs over Spain, ‘natch. The Queen gives a stirring speech when she knights Thorpe on his ship that many claim was supposed to inspire a WWII British viewers at the time. Accurate, it’s not, but entertaining, it is! This ranks very high in Errol Flynn’s sword-and-tights flicks, no doubt. 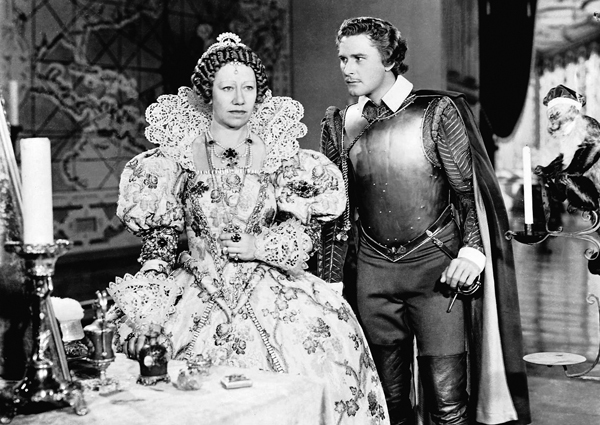 Flora Robson is particularly commanding as QEI, having also played Elizabeth in Fire Over England (1937). And y’know what? 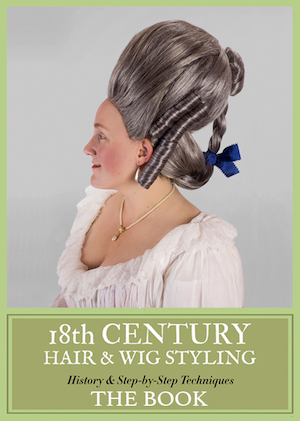 The costumes are strikingly 1580s for the 1940s. 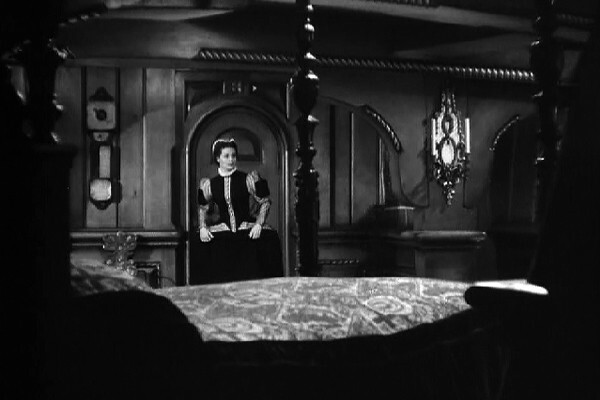 The silhouette isn’t always right (’30s and ’40s Elizabethan films really seem to love wide, narrow panniers a la the 18th century), but the ruffs are spot-on and the rest of the ornamentation is often very accurate. Bonus points for givingDoña María a uniquely Spanish costume, even if it’s about 50 years ahead of the times (compare with these royal paintings of Diego Velázquez from the 1630s-50s). She wears this Spanish 1630s gown in a lot of dark scenes, so I apologize for the terrible screencaps. Terrific braid trim all over the bodice. QEI has a pirate & a monkey. Because she’s the queen. 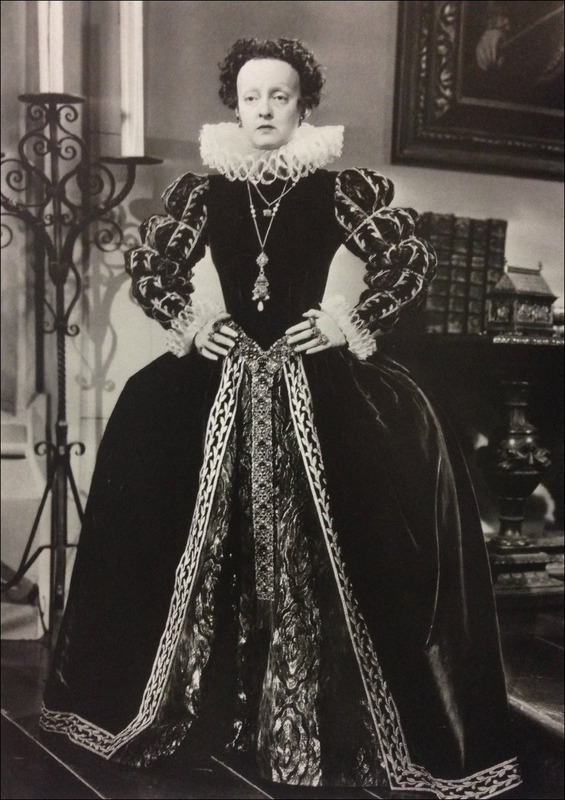 I need to know where Orry-Kelly got all this lace because the pattern is so much closer to Elizabethan than anything you can easily find today. This gown looks so heavy, and yet, there’s still a giant wrinkle in the front. Just using a girdle as a corset or what? Flynn gets a snazzy costume too, and I’ll give him the boots because he is a pirate after all. Are you an Errol Flynn fan? I never saw this movie, bad pirate reenactor I know. However, it just jumped onto my must see list. As for the boots, well if you look at the items found in the shipwreck from the Mary Rose, 1547, you will see that knee high boots were found both amoung the personal items recovered and on several of the skeletons recovered. 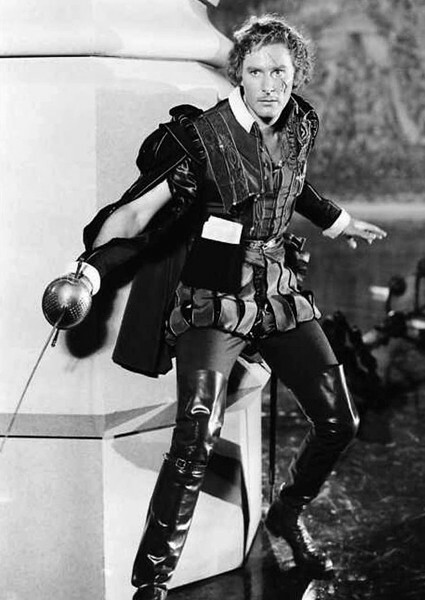 I’m ambivalent about Errol Flynn for several reason. Among which were his stand on WWII and fascism and his treatment of women. As an actor, he seemed one-dimensional. But I cannot deny his eye candiness. Depending on which biographies you believe, Flynn was ambivalent himself, if you know what I mean (and Tyrone Power allegedly did). hsc, I’ve read those, too. Years ago. And his ‘ambivalent’ sexual orientation doesn’t bother me as much as his stand on fascism. apparently the claim that Flynn was a fascist has been discredited. His politics veered rather in the opposite direction. He was most likely quite anti fascist. His treatment of women however is another matter.. 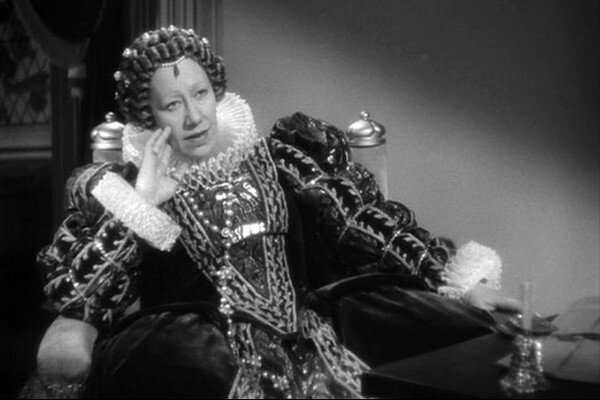 The last photo of Flora Robson– is that one of Bette Davis’ “Private Lives of Elizabeth & Essex” gowns retrofitted with a stitched-on front panel? All the other parts I can see seem identical to the earlier costume. That could account for the bad fit and the “giant wrinkle”. I’m pretty sure it’s the same costume, with that piece added to the front to make it “different”. I can’t find it online, but I’ve got a book with a nice full-length B/W photo of Davis in costume. The sleeves, ruffs, overskirt and the trim on the overskirt edges are identical to Robson’s. As far as I can tell, the underskirt is the same as well, but it’s hard to see much of Robson there. The V-shaped piece Robson has on her “chestal area” is made of the same fabric as Davis’ underskirt, which likely means Robson’s underskirt is the same one Davis wore. It’s trimmed with a big V of the same trim along the edges of Davis’ and Robson’s overskirt– same sort of “twigged” design edged with a solid line on either side. When I followed the Google Image Search back to its source, though, it was the “Recycled Movie Costumes” Tumblr– where they had an entry 10 months ago on Robson’s made-over use of the same costume, and even compare the photo of Robson posted above on this page! I’m guessing the wrinkle is the result of the dress not having an authentic stiff stomacher. Speaking of known Elizabeth I actors, what about Quentin Crisp from Orlando. Beautiful film but the incomparable Sandy Powell was designer. Back to Flynn. It’s strange how this ambivalence kinda vanishes when his Adventures of Robin Hood is on. I love the sword fight. Rathbone was supposedly the best sword fighter for an actor in 1930s Hollywood. Rathbone is the main reason I watch Flynn movies. And Rathbone was such a good swordsman—and Flynn wasn’t—that they had to speed up the final swordfight to make Flynn look more competent than he was. I’m still looking for my Basil Rathbone MCM. Among which were his stand on WWII and fascism and his treatment of women. Flynn was a notorious womanizer, but there were so many in Hollywood that I never saw the point in pinpointing him. As for his stand on fascism . . . he was against it. In fact, he was a major supporter of the forces against Franco during Spain’s Civil War. He was also a diehard fan of Eleanor Roosevelt and something of a liberal. The FBI began investigating him and several other Hollywood celebrities in the early 40s because of their liberal politics. I’m amazed that many people still believe Charles Higham’s claim that Flynn was pro-fascist. To this day. A former U.S. Navy intelligence officer stationed in Southern California had already poo-poohed the idea. With laughter, I might add. As for “THE SEA HAWK”, it is my second favorite Flynn movie, after 1936’s “THE CHARGE OF THE LIGHT BRIGADE”. I’m not an expert on costuming, but the history in that particular movie was off. But I still enjoyed it. 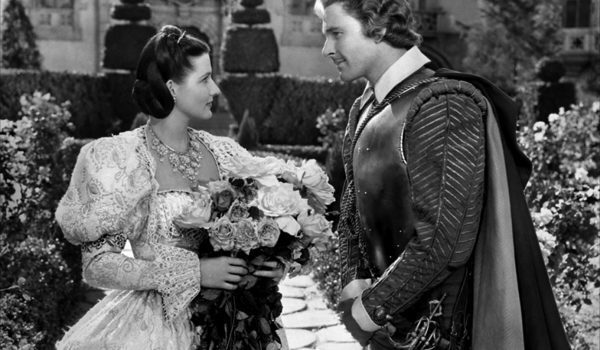 Flynn and Brenda Marshall’s characters in this film reminded me of the leads in a 1957 M.M. Kaye novel called “The Shadow of the Moon”. In fact, I found myself wondering how many times the author had seen this film. Basil Rathbone was the best on-screen swordsman in Hollywood. Or . . . he may have been on the same level as Tyrone Power. Flynn was actually quite good, but he tend to be lazy about it. Except in this movie and “THE ADVENTURES OF DON JUAN”. 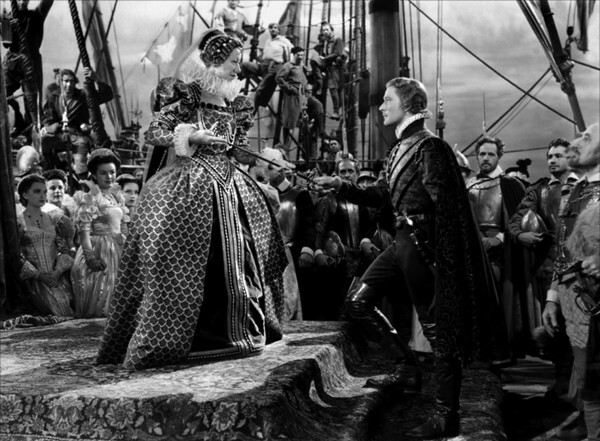 Although Flynn was a very good fencer in “THE SEA HAWK”, co-star Henry Daniell couldn’t fence worth a damn and director Michael Curtiz had to use a double for medium and far shots. Which I’ll forgive, because Henry Daniell is just soooo villainous. My spouse has just insisted that I also mention The Woman in Green, not costume-y despite the title, but featuring both Daniell *and* Rathbone. 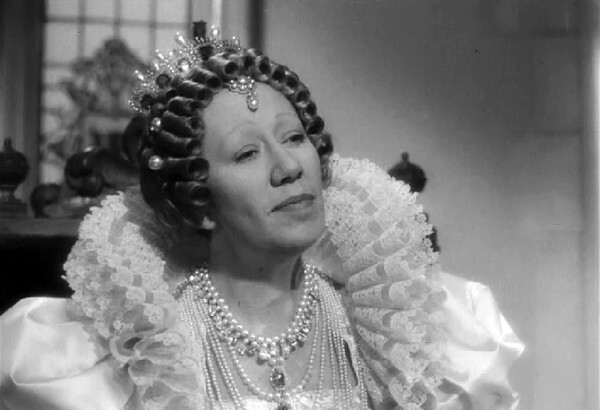 Flora Robson remains my favorite QEI. She’s utterly commanding and exhibits that volatile back and forth of temper that the original Elizabeth was so famous for. I’ve loved “Fire Over England” since I was in fifth grade; and the costumes were what really what first interested me in the 16th century. In that film, what continually strikes me was the way the relationship between Elizabeth and Leicester (Leslie Banks) was depicted. Yes the young leads were entirely ficticious; but that passionate devotion mellowed into what is seen so often by couples who have been together for years is what stays with me. Flynn was a uber fan of Robson. He ditched most of his bad habits – especially being late on the set – when he did this film. Director Michael Curtiz was flabbergasted.